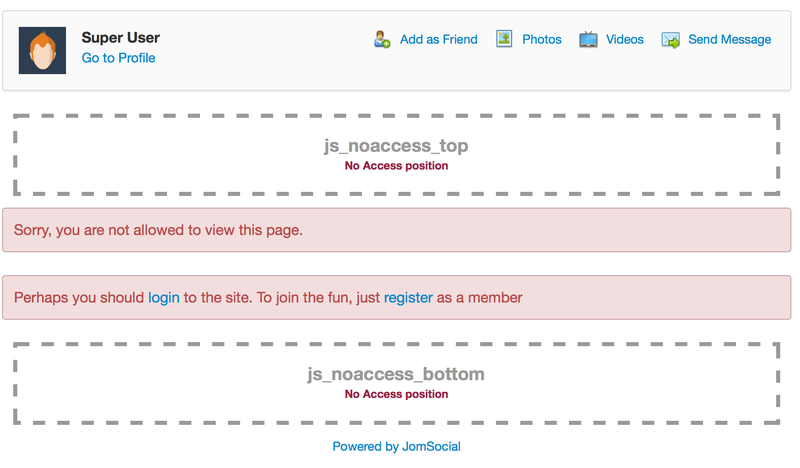 From JomSocial 1.6 forward, you can insert Joomla modules into any part of the JomSocial template. This will allow you to have greater flexibility in customizing the look and feel of JomSocial to your own liking. 3 How to Insert a Module into JomSocial? 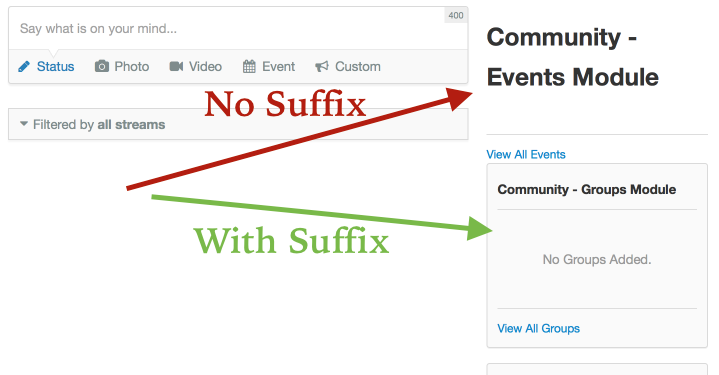 5.6.1 Why Module Class Suffix are Removed in JomSocial 4? We categorize module positions to 3 classes. js_side_top - Placed on top of the side column (sidebar) of Frontpage, Profile, Groups and Events Pages. js_side_bottom - Same as js_side_top except that is placed on the bottom of the sidebar. js_profile_top - Placed between the Toolbar and the Profile Page. js_profile_feed_top - Placed before the Activity Stream section of the Profile Page. js_profile_feed_bottom - Placed after the Activity Stream section of the Profile Page. js_profile_side_top - Placed before any JomSocial content on the side column of Profile Page and after js_side_top. 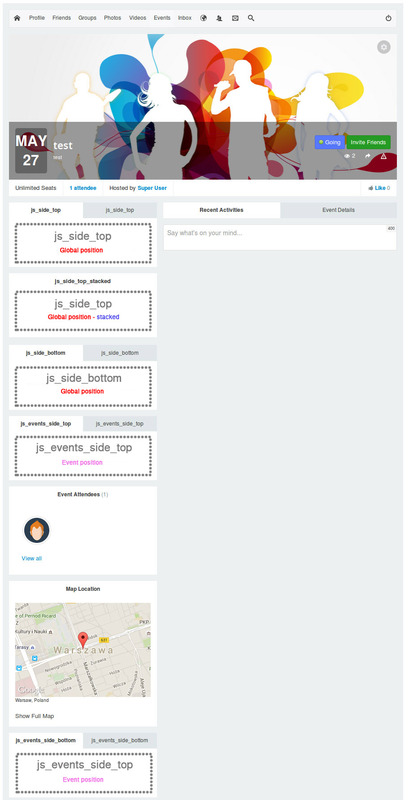 js_profile_side_bottom - Placed after any JomSocial content on the side column of the Profile Page and before js_side_bottom. js_profile_bottom - Placed at the bottom of Profile Page. 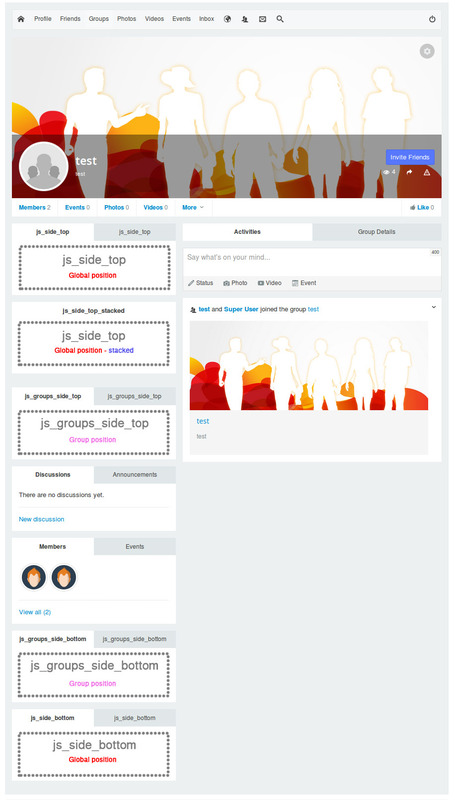 js_groups_side_top - Placed before any JomSocial content on the side column of the Groups Page and after js_side_top. 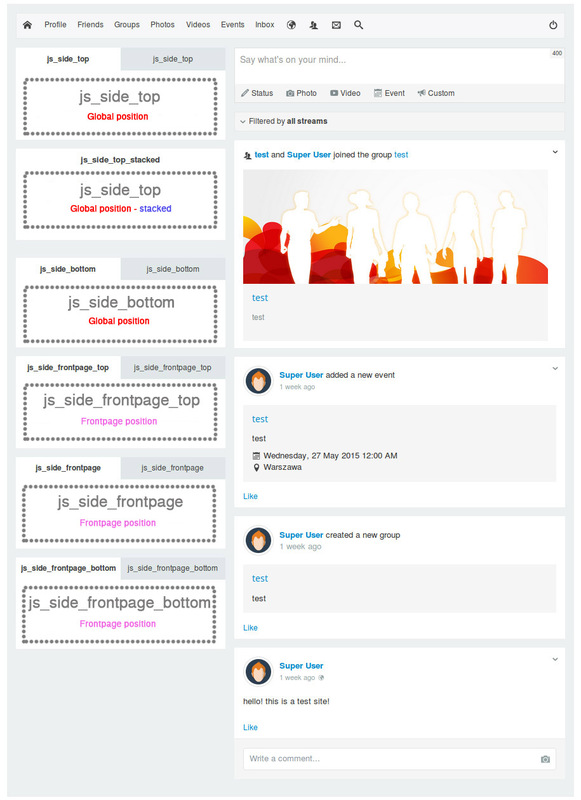 js_groups_side_bottom - Placed after any JomSocial content on the side column of the Groups Page and before js_side_bottom. JomSocial 4 js_side_frontpage_top - Top frontpage position. On clean installation will show Members and Who's Online modules. js_side_frontpage - Middle frontpage position. On clean installation will show Photos and Videos module. How to Insert a Module into JomSocial? In the Joomla Administrator Backend, go to Module Manager (Extensions > Module Manager). On the Module Manager page, you can either create a new module or select an existing module you would like to place in JomSocial. In the Edit Module page, under the Details field set, there is a parameter called Position. Manually enter the name of the module position (you may refer to the list of built-in module positions above). Click Save and your module will appear in your desired area. This is an old feature that will either be, or it is already removed. You are strongly advised not to use this feature in current version of JomSocial as it's functionality have not been tested, and might not even exist. For jomSocial 2.6 and below - " cModule"
Note: Add module sufixes without quotes, but with white space in the name. Why Module Class Suffix are Removed in JomSocial 4?